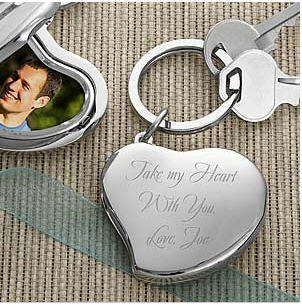 This personalized, Shining Heart Locket Key Ring carries keys and favorite photo memories everywhere you go! 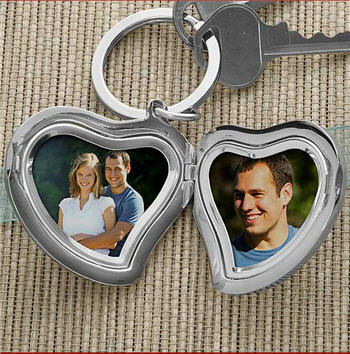 Designed for women on the go, our heart locket clips shut to keep your treasured photos safe. Presented in an elegant velvet drawstring bag for impressive gift-giving. Give her a heartfelt, personalized gift for Valentine's Day, birthdays and more. Quality constructed of shimmering sterling silver-plate with hinged lid for easy open and close. Locket measures 2"L x 2"W x 3/8"D and holds two 1 1/2"x 1 1/2" heart shaped photos. Personalization Details: Up to 3 lines of your message can be engraved including the sender's name. Engraved lines 1 and 2 can be up to 16 characters each, while engraved line 3 or Sender's name can be up to 12 characters. Orders placed for this item cannot be cancelled or refunded. Please ensure that the correct spellings for names are used in the gift message.